I am pleased to have a Samsung SGH-i780. Overall this Windows Mobile smartphone is impressive. Coming with Touchscreen display + QWERTY keyboards, this is my first Windows Mobile-powered smartphone which is more interesting than my previous symbian-powered Nokia 6630 (now i'm using it as a 3G modem :) ). With HSDPA, WiFi, GPS, D/mouse-pad, Bluetooth, etc, this slim pda phone is excellently value for money. Yeah, nothing is perfect, there's a small problem with this device. The camera comes with shutter sound by default without an option to disable it. Yes, i can change the sound, but can not turn it off. Regarding the camera sound, In the Camera application i am actually able to enable or disable the 'Zoom' and 'Brightness' sound through the Tools Options. Nevertheless, i can't disable the Shutter, Start and End sound.. Yeah, No options are available for disabling them. Fortunately, after Googling , i was able to solve this small problem. After installing a registry editor, i can run command in Windows Mobile 6.1 to run regedit to edit the REG keys. In case you're having the same problem, don't worry, I'll share with you the how-to for completely disabling the camera shutter sound by using the registry method on your Pocket PC. 0.You’ll need a regedit program (mobile registry editor) so download and install one. 5. Done. The camera shutter sound should now be completely OFF. Good luck! > After turning off the camera sound in the registry, The camera/video camera which had very slow shutter speed, Now it's slightly faster..
> How do I enable back camera shutter sound? You can enable the Shutter sound and the Start and End sound through the Options page, Just change the sound and it will be enabled again. - OR - Restore the original REG keys settings (before editing the step 4 above). Looking for Free Mobile Bible app for your Samsung SGH-i780/other WM smartphones? Download Mobile Bible. 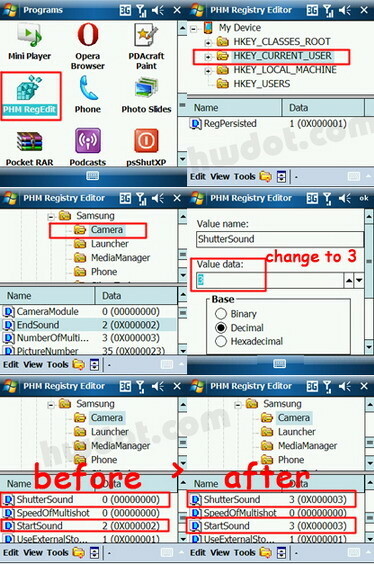 6 comments on "How to disable/turn-off camera shutter sound on Samsung SGH-i780"
Will these instructions work for the Samsung Code as well? Thanks great help! Good guide. I used Totall Commander 2.0 to edit my registry.